What Is A Comedone Extractor & How Does It Work? What Is A Comedone Extractor — & How Does It Work? Photo: Courtesy of Dr. Pimple Popper. The more intense surgeries performed by Dr. Sandra Lee (aka Dr. Pimple Popper) should be watched with caution — not just because they tend to be gory, but also because they are absolutely not to be performed at home by the average popaholic armed with a lance and a cyst to be dealt with. Still, when we watch her treat the more relatable, low-stakes conditions — like a minefield of tiny blackheads that looks identical to the one occupying the bridge of your nose — it's easy to think, Maybe I could just squeeze those buggers out myself, Dr. Lee-style. The main reason dermatologists advise against doing your own blackhead-popping at home is because the possibility of scarring and skin irritation is sky high. But it can be done safely, if you know what you're doing — and you're well-equipped with something a little more medical-grade than your fingernails. To ready yourself for a bathroom blackhead-extraction that doesn't create a bloody, blotchy mess of your face, you're going to want a comedone extractor, the silver, tweezer-like tool used in the official DPP operating room. 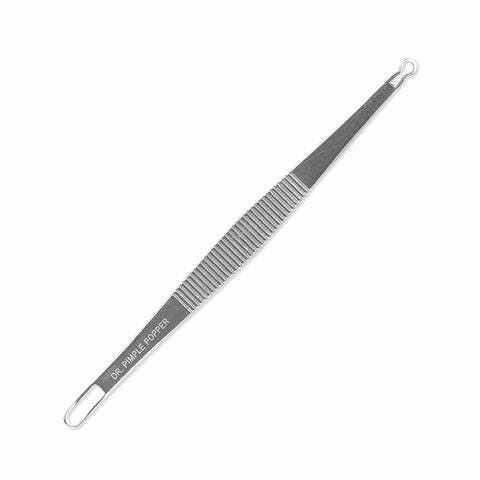 You can buy one for just $20 through Dr. Lee's SLMD skin-care line, and you'll get the extractor — a tiny tweezer with thin wire loops on both ends — delivered straight to your door. Now, if you've watched a blackhead-extraction video — the nose and ear montage varieties are uniquely satisfying — you've seen Dr. Lee wielding this little guy, but you may still be intimidated to put it to your face. To help you out the next time you're staring at your reflection in the bathroom mirror, holding the tiny tool between your fingers, Dr. Lee breaks down exactly how to use a comedone extractor safely and effectively. "Start by cleansing your skin with warm water," says Dr. Lee. "Then apply a warm, slightly moist, clean towel over the area you want to treat. Hold it to the skin for 10 to 15 minutes. Then, use an alcohol-soaked cotton pad to disinfect both the skin and the tool before you get started." Dr. Lee recommends holding the tweezer tool comfortably by the textured mid-shaft and placing the wire loop over the blackhead, encircling the black dot with the loop before pressing down on the skin. "Apply slow and even pressure lightly across the area to release the contents," Dr. Lee says. At this point, the white pus should emerge from the clogged pore, and you can then clean and disinfect the skin and the tool. But — and this is very important — if the blackhead doesn't pop out with light pressure from the comedone extractor, do not continue to dig at it. In the wise words of Dr. Lee: "There's a time to pop, and a time to stop."